Let’s celebrate the next generation of leaders! Summer is just around the corner and you know what that means! Every summer, the Bus community gathers to celebrate the next generation of leaders! 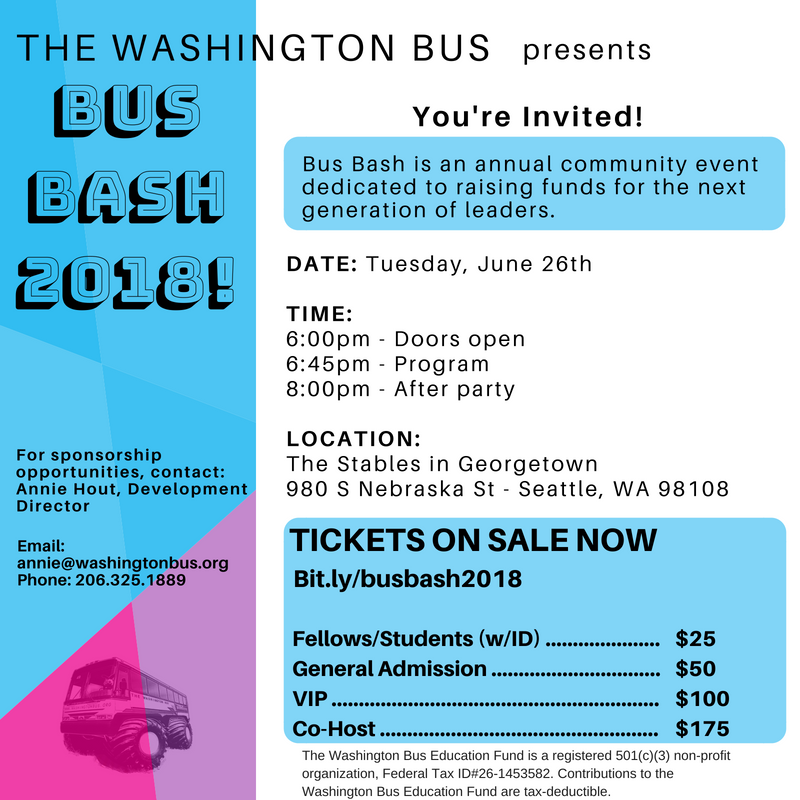 Join other Bus supporters, community members, business and civic leaders, and Bus alumni for food, drinks, music, and more — all in support of the Washington Bus Education Fund, which trains young leaders to organize and connect thier values to civic action. 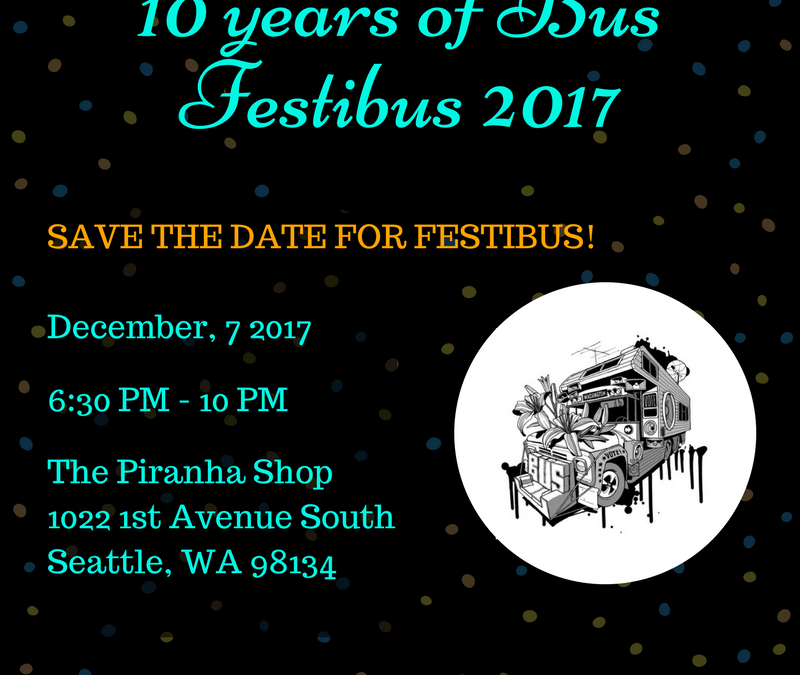 Tickets to the event are $50. There is also a $25 discounted option for students with ID. 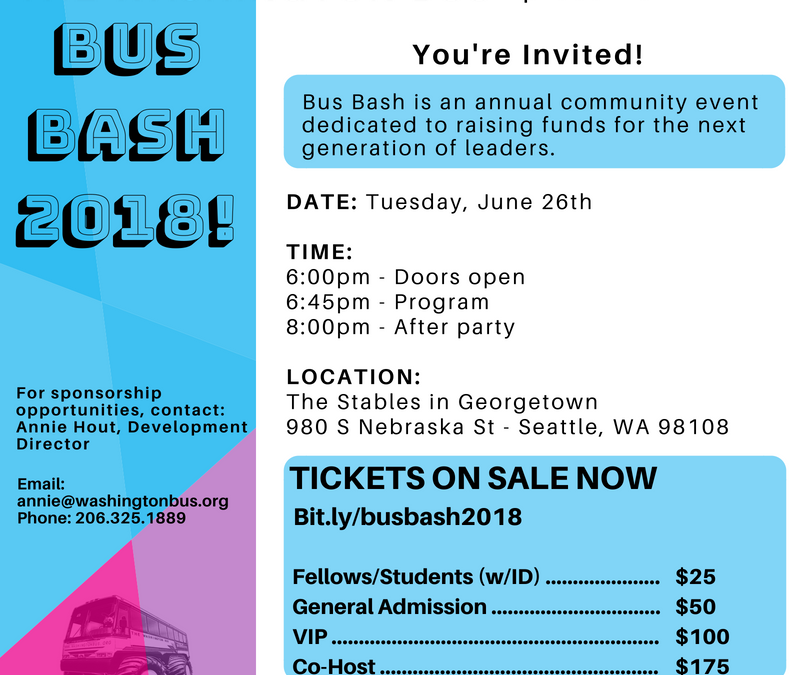 Get your tickets, invite some friends and join us on June 26th! Our Fellowship application is currently closed. Please check back in March 2019! 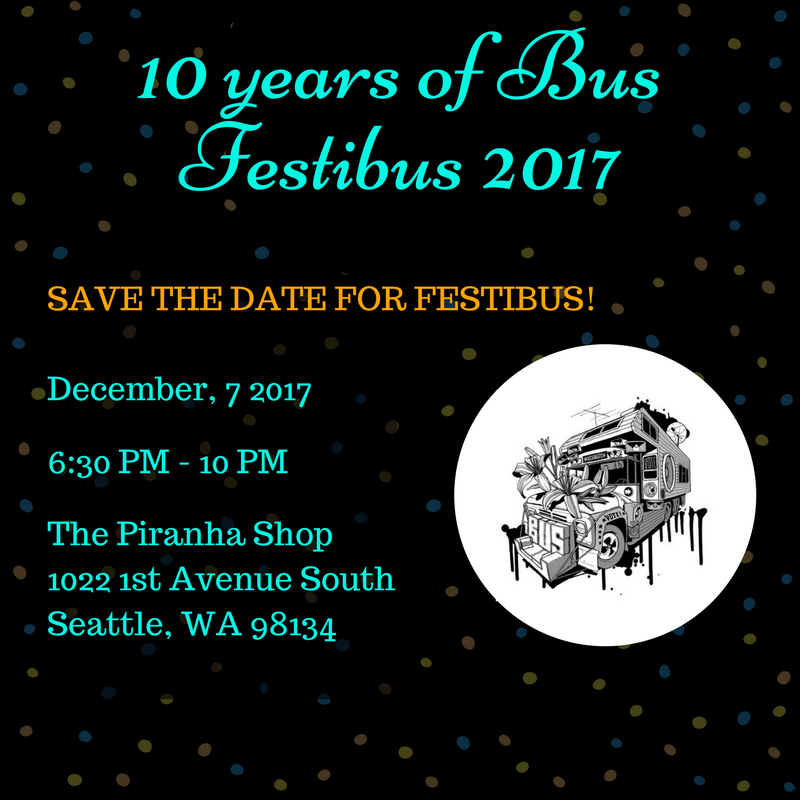 The Bus Fellowship is an intensive, intentional, and transformative experience for young folks who are ready to inspire change alongside their communities. Over the course of ten weeks, Fellows learn from progressive experts from across the state, run the most innovative, effective, and fun civic programs in Washington State, and collaborate with community organizations and issue campaigns for hands-on organizing experience. For information regarding the Fellowship or questions about the application process please contact our Community Engagement Coordinator, Bridget Williams. Bridget can be reached at bridget@washingtonbus.org, or (206) 325-1889. 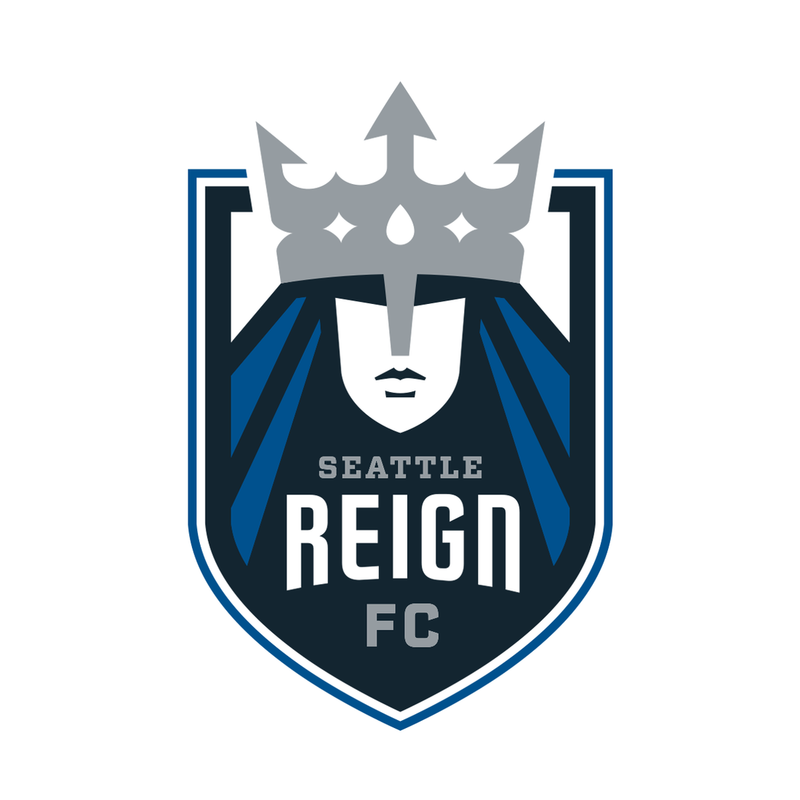 The priority deadline for applications is Friday, March 23rd 2018 at 11:59 PST. Applications will be accepted until Friday, April 20th 2018 at 11:59 PST. We encourage applicants to apply as early as possible as the application process becomes increasingly competitive with each deadline.